To win the race and become world’s number one, Samsung and Huawei are trying their best to introduce the first Infinity-O smartphone. Huawei revealed the official date on its Weibo account on December 3. 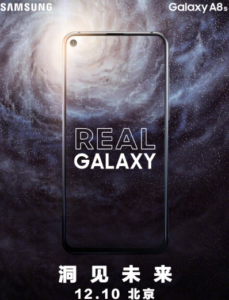 Maybe in a fear of lagging behind; a poster for the Samsung Galaxy A8s launch date was shared which gives us a clear look at the Infinity-O display. Finally, Samsung Galaxy A8s set to release on December 10, 7 days before the launch of Huawei Nova 4 on December 17. Both the smartphones will be announced in China on the respective dates. They are expected to reach globally, thereafter. Samsung is also planning to bring Galaxy S10 with Infinity-O display in 2019 after the Galaxy A8s. Samsung announced its first in-display smartphone, a few days back. But Huawei in one of the teaser announced its in-display smartphone to release even before Samsung. Now, The battle is about to end as both the brands revealed the official dates for the event. As per the renders, Samsung Galaxy A8s is expected to feature a triple rear camera. Along with that, it will have a Snapdragon 710 processor paired up with 6GB RAM. The price and other features are not yet revealed. The Samsung Galaxy A8s is expected to have a bezel-less display if the leaked image of a screen protector is true. Huawei launched its teaser showed the upcoming smartphone with ‘punch-hole’ camera. On birthday celebrations of Chinese singer Jackson Yee, The glimpse of an upcoming smartphone was given. 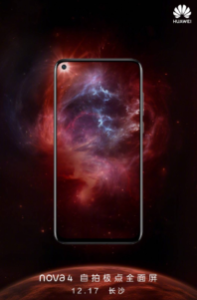 The next day, Ben Geskin, the famous tech leaker published a render of the upcoming Huawei Nova 4 with the same design as seen in the video and other leak reports. There is a similarity in both the rivalry smartphones that the in-display cut out is placed at ‘top-left’ of the handsets and both are expected to have a bezel-less display. Both the rivalry brands are expected to introduce the upcoming smartphones in India in 2019. No official words on the price of the smartphones are given yet.